I am starting to understand ancient man’s reason to tell the myths of Springtime. The Persephone and Brigid myths represent the struggle felt as winter is wont to let go and spring must irresistibly arrive. The old stories of the struggle for power between the Cailleach (the old woman of winter) and Brighid ( whose day is celebrated as the first day of the Celtic spring, February 1st) describes the turning of the seasons from winter to springtime. “In the myths, Cailleach brings winter snows while Brighid brings the first spring rains.” That is how our weather, here, seems to act. We have a few days when it feels spring-like, only to be blown away with gusts of sleet, snow, and freezing rain. Spring almost seems to be the myth, and we doubt our memory of the warmth, the resurrection of our green earth, and the growing season once again appearing. But it will, it will. Probably the crocus flowers are the most indicative sign of spring, though the snowdrops precede them in blooming. The snowdrops have their milky white and green daintiness, not vibrant enough to declare the spring as the clear golden yellow, bold violet, and gaily striped crocus. the crocus, little as it is, sings of spring and gathers the accompanying humming of bees to proclaim the victory of spring’s warmth. Even an April blizzard can’t quiet the sound. But today,the winter’s quiet rules my garden. And only memory allows that spring is coming, and the hold of frozen cold cannot stay. Spring is silently marching northward. My heart hears its approach. This is a inquiry for the webmaster/admin here at ilonagarden.blogspot.com. Can I use part of the information from your post right above if I give a backlink back to this site? well, Daniel, if you would leave your url, where you’d like to use it, and where the backlink will be… we can go from there. Thanks for stopping by my blog. I look forward to exploring yours. 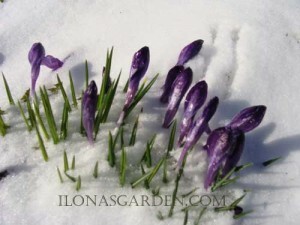 Love the photo of the crocuses in the snow! We got those few teasingly warm days and now are back to snow and ice. Crocus might be my favorite spring bulb, especially Crocus ‘Spring Beauty.’ What a beautiful post! Thank you Kateri, the feeling is mutual- I love your blog! The funny thing about this photo is how disappointed I was that the snow had fallen on all the beautifully blooming flowers, but the picture was something of making lemonade out of the lemon. It was a record of “look what happened to my crocus” that became just the right photo for this post 🙂 Happy fairy tale ending. Thanks, Anne- crocus does have endearing traits. I used to grow so many, but the rodents have eaten their way through many a stand.